In response to two proposed laws introduced for voting by the Hungarian Parliament and which threaten the scientific autonomy and financial independence of the Hungarian Academy of Sciences, the ALLEA President Antonio Loprieno has sent an open letter to the responsible Hungarian Minister of Innovation and Technology, Mr László Palkovics. You may download and read the letter below. 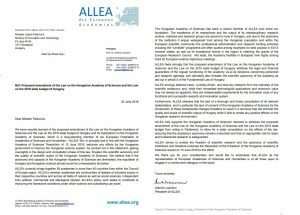 ALLEA Member Academies, the Czech Academy of Sciences, the Slovak Academy of Sciences and the Polish Academy of Sciences, have joined the initiative and published a statement in support of the Hungarian Academies of Sciences.